Can you hoop the loopy worm? Wobbles the Worm has fallen out of the apple tree and he's all dizzy! As Wobbles bobs and spins around, players try to get their three hoops over his head. Get rid of all your hoops first to win! 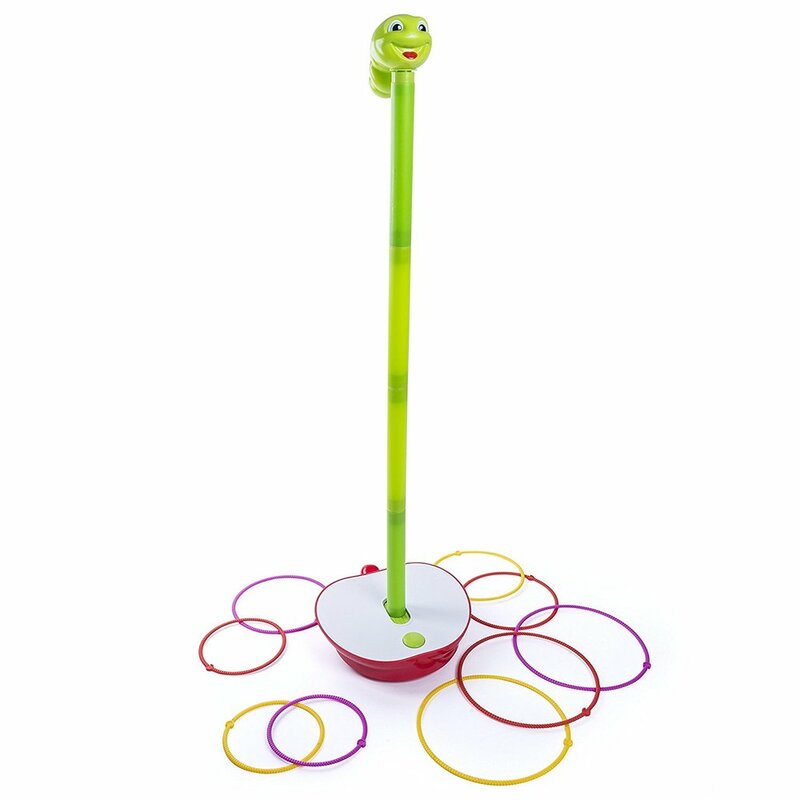 Wobbly Worm is get-up-and-move-around fun for preschoolers! Say hello to Willy... yep that is what the boys have decided to call this long green wobbly worm game; who am I to argue, even if I did spit my coffee out at the suggestion. We were sent 'Willy' the Wobbly Worm game by Spinmaster to test it out over the loooonnnng British summer holiday, because I'm pretty sure they predicted the rain and wanted to save us from the 'I'm bored' cries. Wobbly Worm is a game for 2-3 children aged 3+ and has 3 different levels of difficulty depending on your height and age. The brightly coloured green worm stands tall on half a red apple. The apple has 2x C batteries inside it (not included, which caused havoc in the caravan), when you press the apple's button it begins to rock and wobble, sending (Willy) the worm into a spin. There are 9 plastic rings, 3 in each size and colour, each player gets a set (a different colour) and takes 3 steps back from the worm. The aim of the game is to try and get all of your rings onto the worm (Willy) whilst it's wobbling like a crazy thing. The worm can be reduced in size to make it less wobbly and easier but don't be fooled, it's still a challenge. The worm is quite loud, which is not great for the other people in the room not playing. It can also get quite stressful for smaller children who don't like to lose *coughs* Rocky *coughs* but it is pretty fun to play as a family. We agreed that the taller players had to kneel and do it further back, so that it was fair but that is because of the huge height and age gap between Rocky and Kyd. We actually really enjoyed it though and it has been a huge family hit whilst on holiday in the chalet, proving it's the simple things that make the most fun.